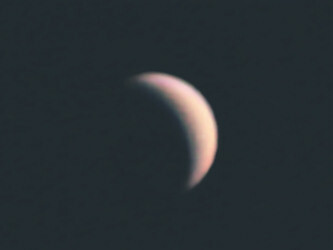 Venus is once again visible in the evening sky. At the moment it is actually on the far side of the sun, and very small. This isn't going to be a good appearance of Venus this year. As the planet gets nearer it will drop towards the horizon, and will roll about there from the summer onwards. It will make observation of Venus as it gets larger very challenging. Time to revisit Venus. However, even after 2 months it isn't much bigger than it was in April - still only 14 arcsecs across. 77% of the planet's disc is now illuminated. This photo was taken at 14:39UT, so at least the planet was nice and high. Unfortunately it will be dropping quite rapidly over the next few months. 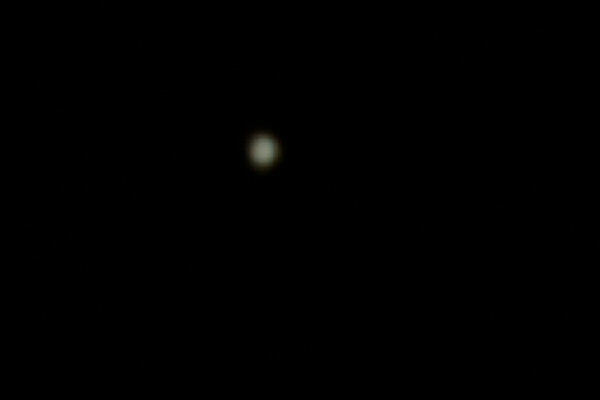 Aratus wrote: Time to revisit Venus. However, even after 2 months it isn't much bigger than it was in April - still only 14 arcsecs across. 77% of the planet's disc is now illuminated. This photo was taken at 14:39UT, so at least the planet was nice and high. Unfortunately it will be dropping quite rapidly over the next few months. We've recently been traveling through Spain and were able to entertain a French couple with that view of Venus one evening through our 127mm Mak. Earlier in the week we'd delighted (and maybe inspired) a couple of Spanish children of about 7 and 5 with a view of Jupiter and some of its moons. We'd hoped for better skies, but they've been disappointing overall. 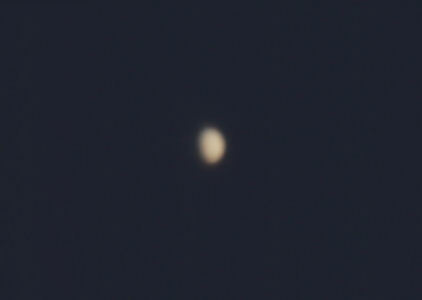 On 6th July I took another photo of Venus. It was taken at 1504UT. ISO100 and 1/2000sec. I tried to see Mercury which at the moment is about as far from the sun in the sky as it gets, but sunlit haze drowned it out. I haven't managed a decent image yet. Some of it is due to a tree but I've also had a lot of technical issues with PCs crashing and difficulty getting focus. Focussing on Venus is never easy. Theoretically you should be able to see an edge quite easily, but the reality is that it is such a bright object that it creates a halo. Knocking the exposure down reduces the halo, but that creates other problems. Focussing on a star first, and then moving over to Venus is a good technique. I thought perhaps a haze free sky this afternoon might give a good view of Venus, but the heat currents made it very hard. A whole afternoon of attemps finally gave me this photo. 4 lots of (25 of 1000 ) frames! 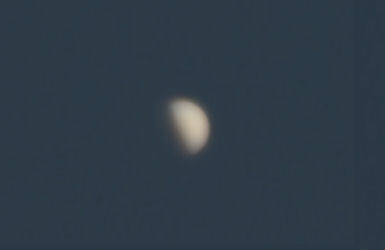 The illumination of Venus is now 55%. The size is 21 arcseconds, which compares with Mars at the moment at 24. Venus continues to be south of the sun, and as the altitude of sun has been falling as we go into Autumn, so has Venus. Venus sets within minutes of the sun, and cannot be seen in the evening. It is about the same altitude during the day as Mars is at night - so pretty useless. Its illumination is 23% and size is 42 arcsecs, double what it was 6 weeks ago. This is 50 images from 1000 - none of them much good. I went walkies with my wo-wos and could see Jupiter low down, with Saturn and Mars further south and higher up but no Venus. Shame I can't visit my in-laws.